Pan Sprease all-purpose release spray creates a non-stick coating on a variety of surfaces, including grills, casserole dishes, and fry pans. Made with canola oil to handle high heat, this spray is free of fat, cholesterol, calories, and sodium. Plus, it's easy to use. Simply shake the aerosol can and spray a light coating onto the cooking surface to create a surface from which foods will release easily. I purchased this on a whim. Not really expecting too much for the price. But this stuff is really great. seems to work just as well as my name brand spray, but at a FRACTION of the cost. will definitely continue to purchase! Pan Sprease allows a stress free experience, ensuring your dish slides out of the pan, regardless if you are baking bread, dessert or that perfect casserole. Works great. We have compared this to the bakers sprease which is more expensive, and really can't tell the difference. Used in our bakery on most baked items. This is a very good pan spray for the price. We use it on our muffin pans for cornbread muffins. The price is very good and free shipping with Plus shipping. We recommend. This spray works great, iv'e been using Vegeline for years, this spray works just as good and is much cheaper, switched a year ago and never looked back. This is the best non-stick spray I have used in the past decade. It makes removing food from pots and pans easy and does not leave a residue on utensils or food. Most importantly the spray mechanism is exceptional--over the years, I have had to throw away a number of half used canisters of retail sprays because the spray nozzle would clog. I have been using this spray for months on a regular basis with no issues at all. Additionally, as i just stated, I have been using it for MONTHS--this speaks to the quantity and quality of the product (a true value). The Sprease 16oz All-Purpose Release Spray is a great addition to any kitchen! This is a wonderful product. It works fantastic and lasts a long time. It is better than the name brand stuff and cheaper by far. Oh my goodness. This spray is awesome...worth the money. The spray is great for baking or any of your cooking needs. I ordered a case recently and will continue to order. I decided to try one of the all purpose release spray to see if I liked it. It works awesome and I will definitely be buying more in bulk next time. Great spray for the value. Easy mist spray instead of solid stream for better coverage. Easy snap on cap for storage. Spray nozzle sometimes clogs and falls off. Thank you for your feedback! We’re sorry the nozzle sometimes clogs for you. For recommendations, please contact our Customer Solutions team. This spray is the kind of product you do not know you need before you start using. It is much cheaper than the competitors and does the same job. It is very useful, and makes you life easier, not to mention one bottle lasts a reasonable amount of time, and here you are getting 6. Every bit as effective as popular brands, but a much larger can at a much lower price. Well packaged for shipping, and an excellent value. A very nice quality all purpose release spray and great for our sweets shop. The spray greases our fudge pans wonderfully and the fudge pops right out. the all purpose release spray , speaks for itself uses very little spray food just don't stick, we us it all the time its very low price . thanks webstaurent. We go through these like no tomorrow and they are awesome. You really cant beat the price and they work as they should. I would recommend these to anyone. This spray is great! It definitely works and I think it's better than your leading brand of non stick sprays. I would definitely recommend this product! I was quite impressed with this product! A popup came up when I was looking at the brand name. i was skeptical but for half the price it is every bit as good!! This spray works with our products. Really keeps items from sticking to the pan and creates a nice finish. We would recommend this spray for future use. it is great product, convenient, and easy to use. basely just spray it over surface, pan , or pot before starting cooking or fire. I use it every for out breakfast. The pan sprays are great! I’ve been using them for my cake pans and the cakes have been easy to remove. I highly recommend this! This stuff is fantastic and extremely cost effective. Buy the case and it seems to last forever. Use a little on a brownie sheet and you're good to go. We have only used this product for a couple of days but what a money saver. This product works just as well as some of the big name brands at a fraction of the cost. It works very well with eggs on a flat top or in a pan and leaves no flavor. We will continue to purchase this. I used to buy this product from my major food vendor. this product works exactly the same at 1/2 the price, It is also available to ship with out any fees with PLUS membership. Great pan spray I use it to keep our home-made sausage from sticking to the patty papers as well as in hotel pans to keep food from sticking, works great. I was hesitant to purchase this because it's an cheap and an off brand. However, it is still an excellent product. Using this product saves me so much money! We have used PAM in the past but this Pan Sprease does the job and is a lot less expensive. We order a lot of this. If you use a pan spray this one is perfect. Price is right and it comes carefully packaged. Never had a broken nozzle during delivery. I have been using it for few months and it works like a charm. I use it once a month to give some love to my stove or pans. Though I read the description, I was not prepared for how large this can of spray is! With over 1000 sprays per bottle, you will not run out anytime soon. It’s sprays evenly without buildup. Perfect for an industrial or home kitchen. The pan sprease all purpose release spray is a great item to have on hand in our bagel shop. Works great and perfect for toasting them in the oven. This pan spray works as well as any we have ever tried, and you simply cannot beat it for the price. We use it in our muffin pans and get a great release. Highly recommended! Sprease does a nice job at releasing. It leaves way less residue than most of the other brands out there. Easy release. easy clean up. Such a great product! Leaves little or no flavor in crepes or eggs and is competitive with the national brands, and only a fraction of the price. Doesn't burn easily! Sprease is a great value brand of cooking spray that is great for clean cooking. The all purpose spray is excellent quality and works great for cooking eggs. A great value cooking spray that is great for non-stick cooking. The spray is a great value and quality. The all-purpose spray is perfect for all cooking pans and skillets. This is a must have in my home for cooking. It’s so easy to use and with it food will not stick. That means less burning and easier cleanup ! This spray was nice I still have some last me all year.coats pans and baking or etc. We'll done customers service is well done thanks. This is a great all-purpose spray release, I use it for everything. It helps food release easily, and cleans up easily without leaving a residue. These cans are much bigger than the ones sold in the grocery stores, and buying them in a case helps them to be even more economical than they are when you buy them one at a time. 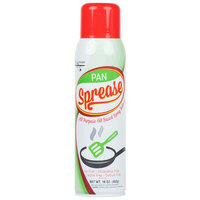 The Pan Sprease all-purpose release spray is great and perfect for spraying skillets or baking pans. No bad taste or smell left from the spray and no messy, sticky messes either. A great spray. This is. A great pan spray for our cornbread muffin pans. You can use in waffle irons as wells. The price is great as well. We have been using this Pan Sprease 16 oz. all-purpose release spray on our pans when cooking stir fries, eggs, meat, and all don't stick to the pan. Very nice product. Pan All-Purpose Release Spray works like a charm and the price is very budget friendly compared to other on the market. I love that it doesn't have an artificial taste and can be used for everything in our kitchen. This can is much bigger than I expected! A quality nonstick cooking spray. I will be using this product instead of other name brands from here on out! This works great for an all purpose cooking spray. Nothing sticks with this product. Clean up is a breeze because nothing gets stuck to my pans. I usually add this as an afterthought to my reviews, but in this case it deserves to be right up front: The price cannot be beat! Over three times as much product for less than half the price! Anyway... I bought this after having a falling out of sorts with the butter-flavored spray (the Vegalene, sold on this site) because it started becoming very difficult - and messy - to dispense. Thankfully, this product does not have the same issues. I mostly use this to prevent sticking on egg rings, as a fine oil mist to give baked foods a crispy exterior, or as as “glue” to hold the butter-flavored salt on homemade popcorn. It excels at all three tasks. This variety is unflavored and has no aftertaste. This pan spray is comparable to others on the market, but at quite a reduced cost. If you are a restaurant on a budget and need a non-stick spray, this product will work for you. We prefer to use organic and local food products whenever possible, and would not use this at one of our dining events because of the additives in the ingredients. A really great value brand of all purpose release spray. It is great for spraying my skillets before cooking. The food cooks great and comes right out with no sticking. I really like this all purpose spray. It's far better than the brands in the grocery stores and the can is much larger. I bought one can of each of their "sprease" types and I have to say I am impressed by all three. Another winner for Webstaurant. I would recommend this spray release to any chef or cook that needs quick food release when baking or sataing foods. Great value in an oil based release spray. This product works very well. We use it in our bake pans as well as our chafing stand deeps to prevent food from sticking. I have had no trouble with anything sticking to the pans. Great product for a reasonable price. This was a suggested alternative to Vegalene, which I also like. This works just as well, if not better, and you can't beat the price! Great product as usual from Webstaurant Store! This sixteen ounce can of Pan Sprease All-Purpose release spray is a winner. The taste is remarkable for it being a spray and the consistency is the perfect addition to any fry pan. I like how easy this release spray is to order and will continue to do so. The fast shipping and quantity discounts are a huge plus. I was a little surprised at how fast the can disappeared. We use this on our griddle and also for our baking in our restaurant. This is the best price that I have found thus far for all purpose release spray. A great spray that is designed to keep food for sticking. We spray all over our grill pans with this spray and it works great. Exactly what you would expect in a pan spray. I would not say it is any better or worse than others, it just is an alternative. If the price is right, go for it. This is such a great product my cakes pop right out the baking pan with this spray. It's great no hassle. I also use it for my whoopie pie pans. Good oil-based spray to keep things from sticking. I also use it to help things brown without adding too much fat...for example, last night I sprayed the bread of a sandwich before popping it in my panini press. I didn't have to worry about cold butter tearing my bread, and it added way less fat to my sandwich (also kept the bread from getting grease all over my hands while I was eating it) and it still browned up very attractively. A top notch product replacing all the other sprays used for stovetop cooking. I like the high smoke point, allowing me to start with a very hot pan that would have smoked with the standard off-the-shelf sprays. It pays to shake well before using. Comes out well and does help keep food from sticking, though eggs and meat still will stick if you have the temperature higher. It is great with vegetables and the lid does click back on fairly well too! I can always rely on Webstaurant to sell me grocery store products, but at better prices. This is just as good as the name-brand version, but cheaper! It’s not the best at high heat temps though…I thought it tasted a little smokey to me and not in a desirable way. This is a great canola based cooking spray. It makes cleaning h pans easier and the food doesn't stick with this spray. I highly recommend it. i'm not sure why other brands of pan spray are so expensive, but this stuff is great at like a third of the price. it's great for when you're trying to cut calories. just an all around handy product. This Pan Sprease 16oz All-Purpose Release Spray is an excellent buy! It makes clean-up a breeze and adds heart health fat to food. This is a staple in our kitchen. Fantastic for the price. Works just as well as some of the other items on the market that cost maybe 3x as much so I am very happy with the purchase and would recommend. Long lasting too as a little goes a long way. This all purpose release spray worked great on my crepes. I don't think it left any kind of after taste or residue that some sprays do. This is the best pan release I have found. Nothing ever sticks and muffins literally fall out of the muffin pan. Comes in a nice big can too. Great deal! This pan spray is a great value. None of the other competitors' pricing comes close. The product works extremely well and cuts down both on food loss and clean up time. This spray works great. Arrived well packaged and sealed up so no leaks. This is a nice big can that should last a decent while. Just a quick spray is enough to make anything not stick to your pans. I normally used baking release spray, but went with an AP this time. It works far better than i expected. Holds well at constant temperature. no dry spots, very even coverage. Great stuff. Love this all purpose release spray. So simple to use and works really well for all baking needs. Love that it comes in a 6 pack too. This pan release is as good as anything you buy at the store for far less in price. I picked up several cans, which are a nice size. I will keep these in my pantry for sure! They are very easy to use, I use in bakery department. Especially when I'm making the pancake no more oil everywhere and no one complain about my pancake any more. I love this cooking spray. It doesn't flavor the food you are cooking and is really easy to clean off of baking pans. The large 16 ounce size is great and lasts a long time. We use this pan spray almost everyday. It does its job, and it works pretty well. And you really cant beat the price for what is it. This all purpose release spray is great. I decided to try this to save some money and i am not disappointed. This product is great and i would highly recommend. We use this spray on pans for baking muffins, cookies, cakes and pastries. It arrived as expected and for the price we will order again. THIS IS AND EXCELLENT CHOICE WHEN PAN FRYING LIGHTLY SPRAY AND YOU WILL RECIEVE EXCELLENT RESULTS .THIS WORKS GREAT IN NOT ONLY PAN SPRAYING BUT IS ALSO EXCELLENT FOR BAKING. This spray works just as well as any high-quality sprays from my main suppliers. We use it for grill release and for baking. Much cheaper through Webstaurantstore as usual. Highly recommended by a busy commercial kitchen. This is very good for creating that non stick surface without adding the fat and calories which come with added oils. It does the job. Nice large bottle for the price. More than double the size of the store bought ones that I have in the cupboard. Works great. I will be using this a lot. I've been buying 8 oz cans from elsewhere and now I find out that Webstaurant has the 16 oz cans for the same price. Great deal !! This is a very good economic release spray. A great value and much better than the store bought brands. Highly recommend this product even for the casual home situations. Not just for cake pans, we use this for our sandwiche grill as well to make sure nothing sticks. Why risk losing product when webstaurant has this for such a cheap price. This spray is very economical compare to our suppliers and our line cooks like to use it especially while doing anything that just need a little bit of warming. I decided to give this a try primarily because I was looking for A canola based spray which is much healthier .Great product will buy again. We are very happy with this non stick spray it's all purpose skillets or cake pans it works equally as good we will continue to buy it from WEBstaurantStore . Perfect for baking, pizzas, bread and grilling. The knobs are able to be put back on so there less chance of a lost bottle. A identical substitute to the name brand. All purpose Pan Sprease is wonderful! It doesn't contain a strong flavor like some all purpose sprays. Great for baking & stove top cooking. I also use it in my bowls so rising bread dough doesn't stick. It works like a charm! This spray would just as much as more expensive brands we have tried, and for such a better price. Really happy with this product, and will purchase again. It does not leave a bad taste and it does its job. It is used to remove cakes, brownies, and jell-o molds. The size of the can should go a long way. This stuff gets the job done! I love that there's different sprays for pans, baking, and waffle irons. It's made with canola oil, making it even better. This product was shipped very fast. It was listed as a great price & the product was good. Used on our waffle maker and worked great. This is a home and commercial kitchen essential, I spray all my pans to limit calorie intake. The canola oil in this has a higher burn point making it great for our high heat stove. This stuff is pretty good but we could definitely use something that has more in the can than this. We went through it pretty fast. The effectiveness of this all-purpose cooking spray is impressive. Our trained cooks and bakers would highly recommend this product. It is easy to use and gets the job done!